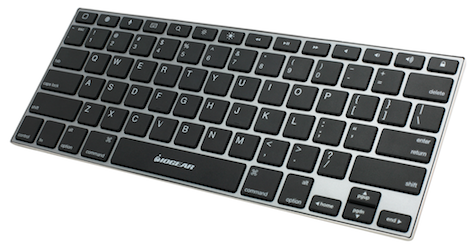 Iogear’s remarkable new KeySlate Ultra-Slim Bluetooth 4.0 Keyboard for iOS Devices is the best Bluetooth keyboard I have ever used. It connects instantly with my iPad Air 2 and works flawlessly. Typing is swift on the black chicklet-style keys with gray letters, numbers, and symbols. The keyboard is not illuminated. I wish it was; or colored white with black letters instead for low light visibility. That’s a suggestion, not a complaint, because the user experience is exceptional. Four small, black rubber dots keep the physical keyboard in place on the table where I’m typing this article. Charging is straightforward using an included micro USB cable and any standard USB charging plug. I’m typing this now on the Iogear keyboard into the Notes app of my iPad. Word suggestions and formatting are located below the text in the iOS external keyboard toolbar. There is a gentle physical travel to the scissor keys and a slight noise associated with key entry; it’s quiet but not silent. If you haven’t used an external Bluetooth keyboard regularly, the experience of mostly typing and occasionally tapping onto the screen for non-typing activity becomes routine after a while. Above the number/symbol row of keys is a custom hot key row with very helpful keys to accomplish screen dimming, audio playback controls, searching, activating dictation, home screen, and leaving the keyboard and returning to it, plus a lock button that puts your iPad to sleep. Everything works the same on an iPhone. The single very best feature of this Bluetooth keyboard is switching between open apps using the Command/Tab key combination, just like on a Macintosh. There are other key combinations and shortcuts that are very handy for formatting, selecting, copying, cutting, and pasting, for example. Hooray! Some contextual menus pop up unexpectedly when pressing and holding the Command key, for example; I’m not an expert on them yet. I just returned from a family occasion where I needed to work on several complex documents from an iPad. This KeySlate Ultra-Slim Bluetooth 4.0 Keyboard for iOS Devices made the typing and editing experience a rousing success, and I would have been in a huge mess otherwise. Bonus: there is a Caps Lock key, a pair of Command keys, and a Function key to enable forward deletion. Bluetooth range is up to 30 feet when doing a large screen presentation or team project. This is a perfect keyboard for business or academic purposes, in addition to personal typing. Construction is solid and lightweight. Battery life is massive. A fabric travel pouch is included. Iogear urges customers to update to the latest iOS system for optimum user experience. I have several Bluetooth keyboards that are compatible with my iOS devices, and this one is by far the best. It goes where I go, now and always. And because it’s a standalone device, you provide your own case or stand that can be used both in landscape (horizontal) or portrait (vertical) orientation.